An Englishman in Colombia: Rendering Again! This morning, it was back to work, and rendering again, I only did one full barrow, as the clouds were gathering. 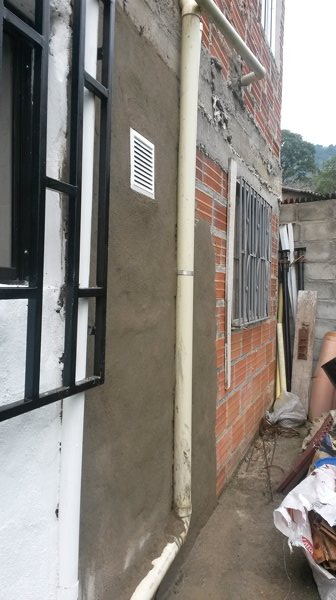 However I couldn't have gone much further, because I need to remove that end window, insert the new one, then fit the new reja, once that is done, I can do the remaining rendering, including that end bit of breeze block wall, between us and the neighbour. However back to this morning, just as I finished clearing up, the clouds moved on, and we have had brilliant sunshine. I ended up cutting our front hedge to make it look as if I have done some work today! I'm not sure when I will get the new window in, hopefully mid week, we have my Mother-in-law staying at the moment as she is incapacitated, and the window is to her bedroom, so it will depend on her...no rush! As you can see, on Thursday, I painted the kitchen window reja, so that now looks much better, and unlike the previous owner I painted all four sides, he only painted three, those that could be seen when standing in what at the time was a bedroom, the outside surface, had been left to go rusty. Once this is all done, I am hoping to get back to some woodwork.